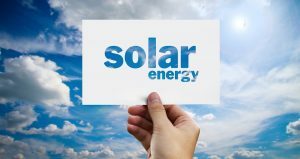 According to a recent ScienceDaily article, collaborations between Purdue University, Georgia Tech, the University of Wisconsin-Madison, and Oak Ridge National Laboratory have developed a new material that boosts solar power’s conversion into heat energy. Most photovoltaics generate power by directly converting solar energy into electricity, but solar to heat energy is another promising option. Heat energy is created by directing several panels towards a cache of molten salt, which then transfers the stored heat to supercritical CO2, which spins a turbine. To make the turbines handle more heat, and spin more, developers changed the materials from stainless steel and nickel alloy to a ceramic/metal composite. Not only do these composites handle higher heat and pressure, the scaling costs are expected to be lower. In addition, such plants can store the heat energy for use overnight, a huge benefit. It appears cutting-edge solar technology is not limited to those pesky TIE fighters! Thank Catherine for the Post! Thanks for the post, Catherine. I'm curious how much you think improvements in solar material efficiencies will aid the advent of solar power. While better power conversion rates are of coures great, it seems like the efficiency of today's tech is already good enough to make solar penetrate the market and it's the installation costs that are the bigger detractor from solar reaching its full potential. Thanks for your comments. I anticipate the cost of renewables including installation will decline as renewables become the standard rather than the exception. I believe this may happen sooner than many currently anticipate.